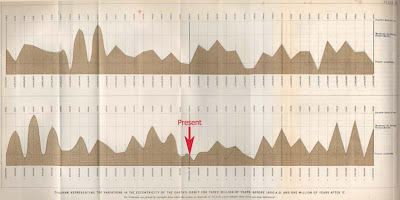 1842, 5 years after Agassiz's "Discourse of Neuchatel", the French mathematician Joseph Alphonse Adhémar elaborated a hypothesis to explain a cyclic occurring of ice ages. He calculated the variations of the "direction" and declination of earth axis and the "movements" of earth around the sun during the geological past. These cyclic factors influence the time and the energy density of solar radiation that reach earth from sun, causing cyclic climatic change. 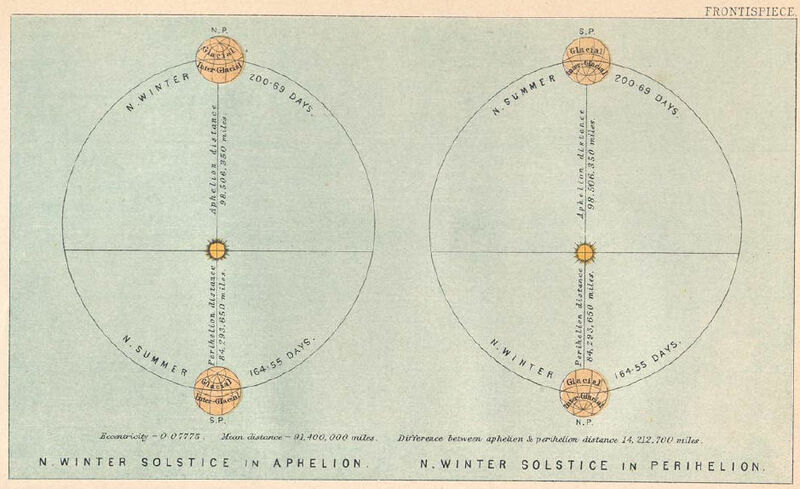 Adhémar proposed that in a period of 11.000 years the hemisphere that experiences a longer winter, resulting from these three astronomical factors, would develop in an ice age. But in 1852 Alexander von Humboldt noted that Adhémar didn't consider an important factor in his calculations, even if one hemisphere experience lower radiation, the opposite hemisphere experience an increase, so in the end the total sum remains more or less identical. Nevertheless the idea of the French mathematician was intriguing, and would influence later researchers. In 1833, James Croll (1821-1890), son of a poor stonecutter of Perthshire, purchased a copy of the "Penny Magazine", a magazine for children education. He was fascinated and began extensively to read, and some time later acquired he's first books dealing with natural science; "At first I was totally confused, but then the beauty and simplicity of the ideas provided me with delight and surprise, and I began seriously to study the matter." 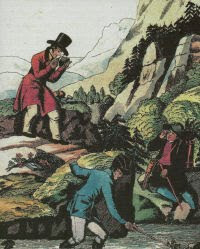 Croll had no easy living in the next 20 years; he travelled the country, most time working as casual labourer, and in 1850 managed (for a brief time) the only Scottish pub were no alcohol was allowed. He then found work as a maintenance supervisor of the Andersonian College in Glasgow, where he had access to the library and the hosted scientific works, a knowledge resource that he grateful exploited. "At that time, the question of what could have triggered the ice age was much discussed among geologists. 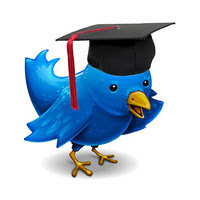 So in the spring of 1864, I directed my attention to this topic." From 1864, Croll corresponded with Sir Charles Lyell, on links between ice ages and variations in the Earth's orbit. This led to a position in the Edinburgh office of the Geological Survey of Scotland, as keeper of maps and correspondence, where the director, Sir Archibald Geikie, encouraged his research. He also corresponded with Charles Darwin on erosion by rivers. Croll, based on observations of the astronom Urbain Jean Josef Leverrier, used in his calculations an important factor that Adhémar did not know, the "movements" of the perihelion and aphelion on earth's ecliptic (precession of the equinoxes). He published his research in the book "Climate and Time, in Their Geological Relations" in 1875. Fig.1. Glacial and interglacial conditions when eccentricity is at its superior limit, from CROLL1875, frontispiece (from FLEMING 2006). Fig.2. 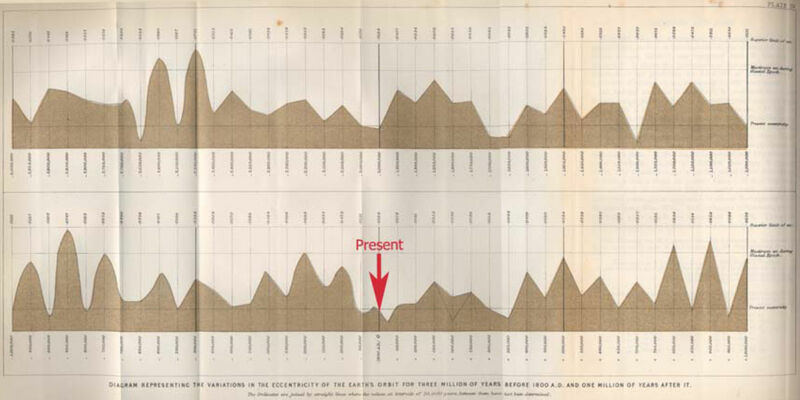 Variations in the earth's orbit for three million years before 1800 A.D. and one million years after it, from CROLL 1875, following p. 312 (from FLEMING 2006). Geikie wrote about the work of Croll: "The astronomical theory seems to me the best solution to the present ice age riddle. It bears in it all the decisive factors for the occurrence of alternating cold and warm periods, and accounts for the peculiar character of glacial and interglacial climates." But there was a problem, even if dating methods at these times were only approximate, geological evidences supported a very young age of glacial deposits, but after Croll´s theory the last glacial period had ended 80.000 years ago. When Croll died, highly respected, geologists considered his theory wrong. Geikie resumed: "It may well be, that with certain modifications of his views; one day we will solve the secret. But for now we must be continue to work and wait." The modifications as hoped by Geikie will come only years later, and a glass wine will be the first step to solve the problem of the cyclicity of glacial periods: Geology and Cyclicity: Milankovitch´s idea. Fig.3. 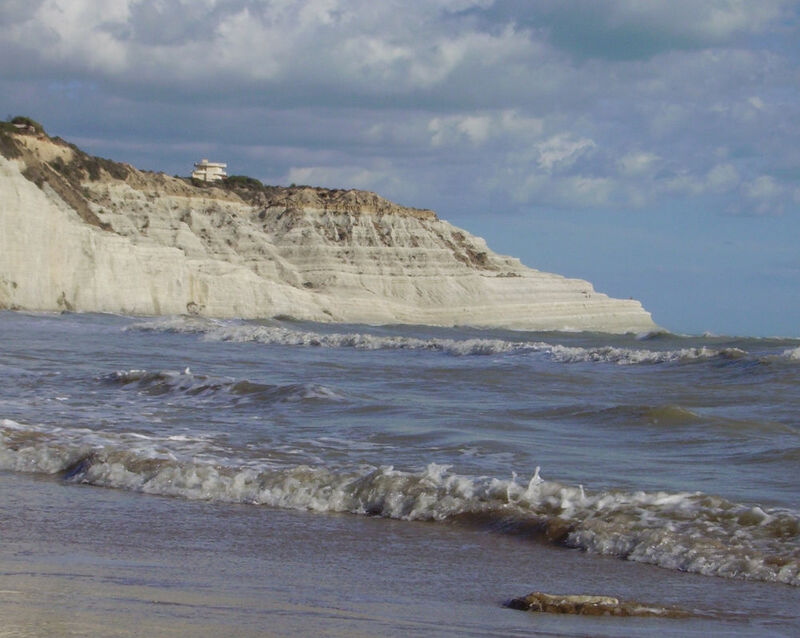 Orbitally forced cyclic sedimentation in the Trubi Formation of Zanclean age at Scala dei Turchi, in the Rossello composite section (Sicily), that represents the template for the Pliocene Series. Fig.4. 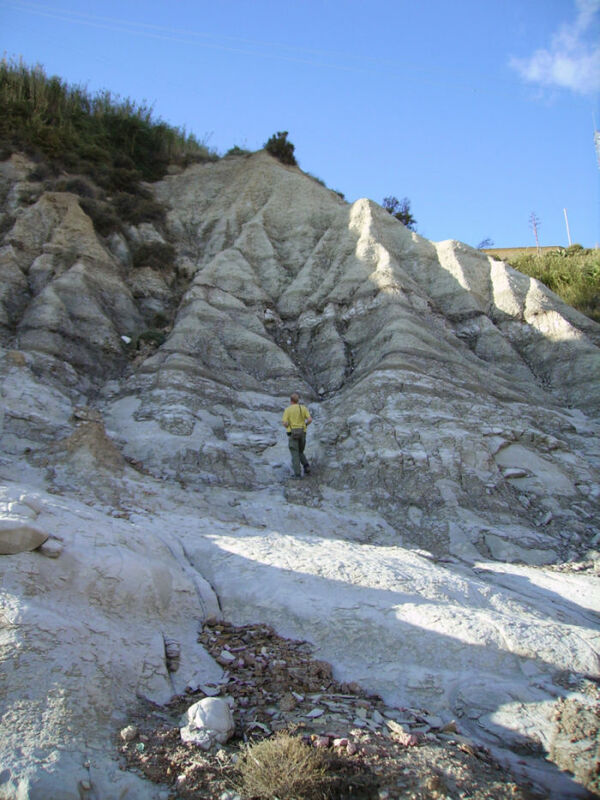 Orbitally forced cyclic sedimentation as expressed in the uppermost part of the Trubi Formation and in the overlying Monte Narbone Formation at Punta Piccola (Sicily), where the Piacenzian GSSP has been defined.